If Harbaugh Leaves Michigan, Could Bears be Interested? Amid a 3-8 season and a chorus of criticism of current head coach John Fox, Chicago Bears fans are likely wondering who the next man will be to lead the team forward, and there’s one name that keeps popping up. That name is Jim Harbaugh, the current head coach of the University of Michigan and a former quarterback for the Bears. Harbaugh, who has a 28-10 record in three seasons as the head coach for the Wolverines, has a massive contract with the school, but rumors have been persistent that he could be looking to make a jump back into the NFL at some point. Fox’s Jay Glazer called Harbaugh a “hot candidate” and that several NFL teams are hoping that they would be able to lure him back into the professional ranks next season. Those rumors heated up even more on Saturday after Harbaugh lost to Urban Meyer’s Ohio State squad for the third consecutive year. That loss put Michigan at 8-4 on the season, and intensified conversations about what it would take for Harbaugh to leave Ann Arbor. 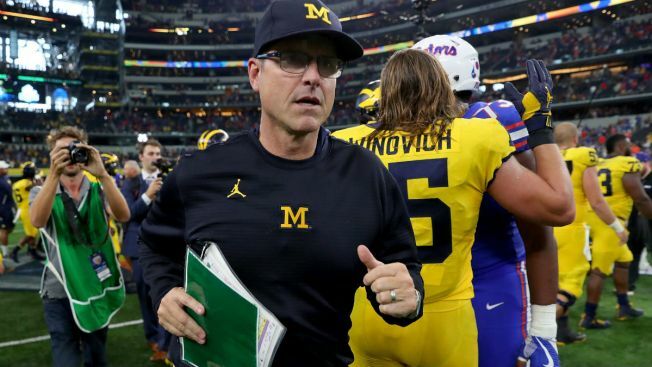 If Harbaugh were to decide to walk away from the $9 million annually that he makes at Michigan, the Bears would almost certainly be interested. Fox’s tenure could potentially end at the conclusion of the current season, as G.M. Ryan Pace looks to hire another coach to help groom quarterback Mitchell Trubisky in the years ahead. Harbaugh has a reputation as a quarterback guru, having helped players like Andrew Luck at Stanford and Colin Kaepernick with the San Francisco 49’ers. He could look at the chance to mold Trubisky as an intriguing challenge, and he would be the kind of home run hire the Bears might look to make their rebuilding effort take a giant step forward. Of course, everything around Harbaugh is hypothetical, as it will be tough for most NFL teams to consider spending the kind of money that he would require to leave Michigan. He would also likely want some personnel control after his highly publicized battles with Trent Baalke in San Francisco, and it’s unclear whether Pace or the McCaskey family would want to give him that kind of power. Even still, with rumors floating about Fox’s future, Bears fans are entitled to dream a little bit, and Harbaugh would be an interesting name to add to the mix.